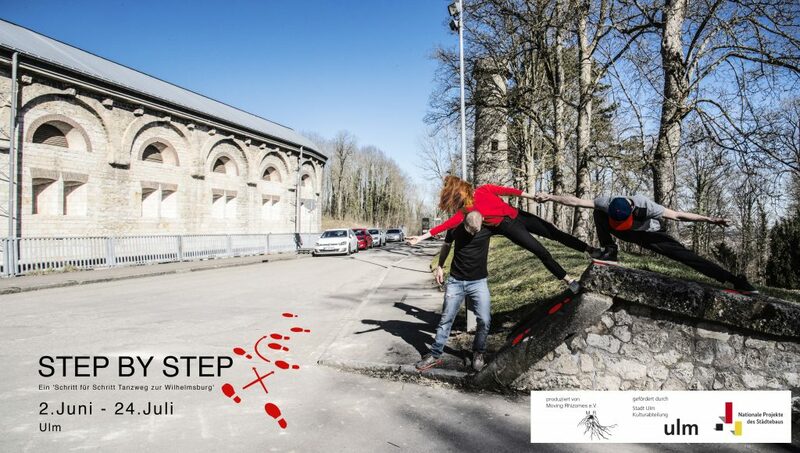 STEP by STEP project is a dancing path from Münsterplatz to the Wilhelmsburg. It is a project we made in Ulm city in the summer of 2017. Our aim was to encourage citizens and visitors to ‘take a dance’ to the Wilhelmsburg, as an alternative to the car or public transport. A ‘Step by Step program’ offered the different activities where professionals and other collaborators showed their own interpretation of the path. STEP BY STEP, was a project sponsored by the City of Ulm Cultural Department and by the Federal Ministry for the Environment, Nature Conservation, Construction and Nuclear Safety under the federal program “National Projects of Urban Development”. It was produced by Moving Rhizomes e.V. It is part of the OPEN SPACE project: Wilhelmsburg 2017. Here you can check some videos and photos from the project.